Today we visit Trough Creek State Park. This is a well rounded state park, with tons of scenic beauty and geological wonders. It offers hiking opportunities for people of all skill levels, beautiful and serene picnic grounds, and more. 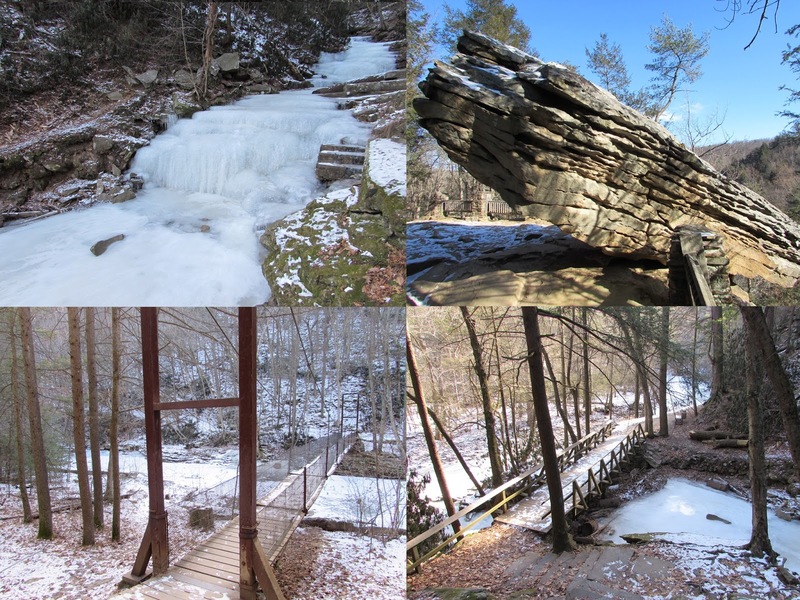 For an article from a summer visit to the park, check out this link, .which highlights some of the other hikes in the park, industrial history, scenic views, and more. Trough Creek State Park has so many beautiful landmarks. We start off at the park entrance, home to a Depression era CCC camp that built many of the facilities we enjoy today in the park. Copperas Rock, one of the erosional remnants and geologic wonders at the park. Its color comes from ferrous sulfate from a nearby coal deposit. Another of the state park's distinctive bridges, a suspension bridge crossing Trough Creek on the trail that leads to Rainbow Falls and Balanced Rock. The Rhodendron leaves all rolled up in the cold. Balanced Rock! This rock looks as if it is about to topple down into the valley, but it has stayed in this position for thousands of years. It is a sandstone erosional remnant. The view from the top of the valley, looking down Rainbow Falls. The valley is filled with beautiful stands of hemlocks and rhododendrons. We did not see one other person in our whole time at Trough Creek State Park on this wintry visit. We highly recommend visiting this state park at any point of the year, along with checking out many of the other awesome things that the Raystown Lake Region has to offer. On this visit, we stayed at the awesome Rooster Roost Bed and Breakfast, an affordable place complete with a wood burning stove.